Working in a library, I am surrounded by shelves. Uniform, bland, easy to maneuver and reassemble. In that pale composite wood which feels like plastic (and probably is). Unmarkable, resilient against dust and made to withstand the daily grind of careless university students. In the grand scheme of things, library shelves are nothing to write home about. In libraries, shelves and collections are measure by metres. "Well, the 300's are taking up 80 meters at present, but are growing rapidly," someone might say. I have never actually bothered to find out if a standard library shelf is in fact, one metre long. The thought only struck me now, typing this, and I feel I am only one day away from a crucial discovery into the inner workings of the library world. Shelves are like bridesmaids - there as a support, but not intended to distract from the object on display. I consider myself a sort of shelf personality: there to lend a helping hand, bolster my friends, a shoulder to lean on. I would love to be a bridesmaid one day. As far as I know, there is no such furniture personality test. More often than not these shelf supports - brackets, frames and what not - are nondescript or non-existant. Great effort is made to make shelves appear as self supporting as possible, stand-alone objects, as if a plank of wood suddenly emerged from a wall,or is sitting balanced there by sheer force of will. 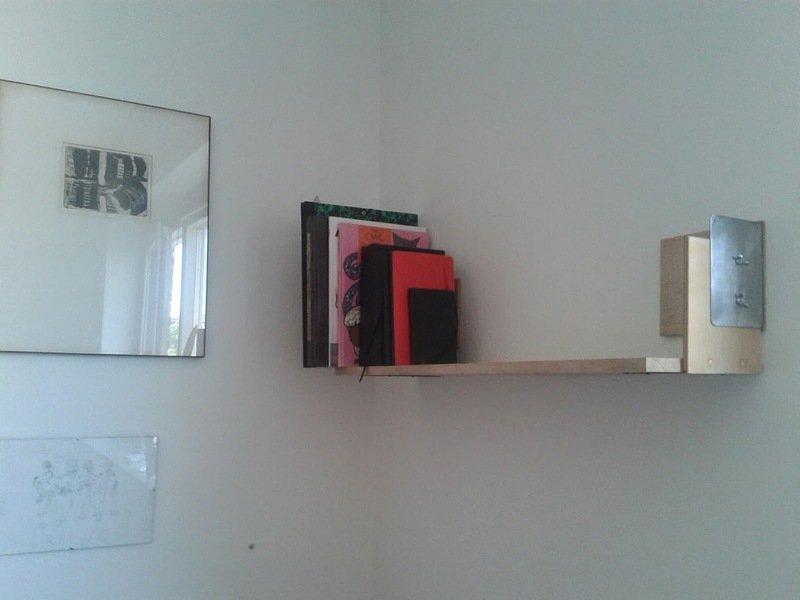 I have started building shelves as sculptural objects. Above are my first two efforts, utelizing discarded bookends sourced from the library. Objects not only functioning as weight-bearing horizontal surfaces adjacent to walls, but as explorations of differing ways by which to affix these boards to said walls. Supports supporting other supports - a network of brackets, braces, and wires tensing and compressing. Juxtaposing different materials, colours, forms in a balanced and harmonious manner. A shelf should be just as pleasing to look at empty.